Intellect is a term used in studies of the human mind, and refers to the ability of the mind to come to correct conclusions about what is true or real, and about how to solve problems. Historically the term comes from the Greek philosophical term nous, which was translated into Latin as intellectus (derived from the verb intelligere) and into French (and then English) as intelligence. Discussion of the intellect can be divided into two broad areas. In both of these areas, the terms "intellect" and "intelligence" have continued to be used as related words. Nous. In philosophy, especially in classical and medieval philosophy the intellect or nous is an important subject connected to the question of how humans can know things. Especially during late antiquity and the middle ages, the intellect was often proposed as a concept which could reconcile philosophical and scientific understandings of nature with monotheistic religious understandings, by making the intellect a link between each human soul, and the divine intellect (or intellects) of the cosmos itself. 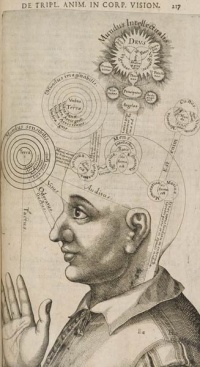 (During the Latin Middle Ages a distinction developed whereby the term "intelligence" was typically used to refer to the incorporeal beings which governed the celestial spheres in many of these accounts. Intelligence. Discussion of Intelligence as the mental ability (or abilities) which allow people to understand things has continued as a subject studied by modern scientific psychology and neuroscience. A person who uses intelligence (thought and reason) and critical or analytical reasoning in either a professional or a personal capacity is often referred to as an intellectual. Unless indicated otherwise, the text in this article is either based on Wikipedia article "Intellect" or another language Wikipedia page thereof used under the terms of the GNU Free Documentation License; or on original research by Jahsonic and friends. See Art and Popular Culture's copyright notice. This page was last modified 17:29, 11 December 2013.